If you’re looking for a way to liven up asparagus, this is it, my friends! 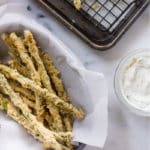 These Oven Baked Asparagus Fries are a garden-fresh alternative to classic french fries and make a great side dish. Adding asparagus to your diet has never been easier or yummier! Lightly oil an oven-safe cooling rack with olive oil and set over parchment paper in a rimmed baking sheet. Set three bowls up for an assembly line for the coating. In bowl 1, add just the chickpea flour. Set aside. In bowl 2, add the eggs and beat. Set aside. In bowl 3, combine almond meal, parmesan, sea salt, and pepper. Set aside. Working in batches, dredge asparagus in bowl 1 (chickpea flour), dip into bowl 2 (eggs), and then dredge in bowl 3 (almond meal mixture), pressing to coat. Place the coated asparagus in a single layer onto the prepared baking sheet. Repeat with remaining asparagus spears. Place into oven and bake for 10-12 minutes, or until golden brown and crisp. Serve immediately. Can serve with ranch dipping sauce, if desired.